Davam Urgent Care is proud to provide pediatric urgent care services at our facility in The Woodlands, Texas. For local families, our medical center is the ideal solution when children are suffering from a non-life-threatening illness or injury. This is because, unlike many of the freestanding emergency rooms that are common in our area, we offer fair, upfront pricing, and there is little-to-no wait time to be seen by a board-certified medical provider. Plus, our office is open daily between 8 a.m. and 9 p.m., so we’re available when your primary care physician isn’t. What’s more, Davam Urgent Care has state-of-the-art diagnostic capabilities. We offer X-rays, EKGs, and lab tests, so your child can receive an accurate diagnosis and corresponding treatment all under one roof. Plus, our fully equipped facility allows us to provide general medical services to the families we serve. For example, if your child requires a physical exam for school or to play a sport, we can perform all of the necessary tests and provide you with the documentation you require. 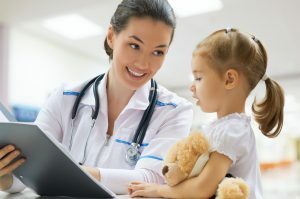 If you require pediatric urgent care services and you live in or around The Woodlands, TX, visit Davam Urgent Care at your earliest convenience. No appointment is required, but you may save time by signing in using our online check-in system.